Can VR training make you a better athlete? For those of us that aren’t naturally gifted athletes, playing our favourite sports in VR can be the closest we get to imitating professional-level football, rugby, or cricket players. Like the FIFA, NFL, or golfing video games on modern PS4 and Xbox One consoles, VR sports experiences offer an avenue to sporting achievements – that don’t involve getting up at the crack of dawn for gruelling interval training. But the spatial element in virtual reality, and the way it’s increasingly able to track the motion, speed, and location of our limbs, could make VR a useful training and diagnostics tool for professional users as well as casual gamers. Or at least, that’s the idea. A number of developers are bridging the capabilities of VR with the needs of top-tier sports teams – including the likes of Manchester United FC and Ulster Rugby Club – in order to bring a more precise methodology to analyzing player performance. To see what all the fuss was about, I tried a number of sporting demos in the HTC Vive Pro headset, using its motion tracking technology to recreate football and rugby training sessions in VR – and discern whether it could actually improve my (or anyone’s) sporting performance. 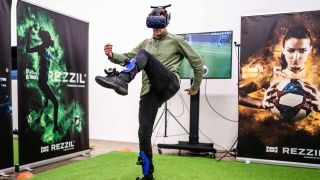 I spent the most time in a football training simulation developed in the Unity gaming engine – a VR training tool called Rezzil used by Manchester United and Italian club Juventus, and developed by MIHIEPA. Slipping on the HTC Vive Pro, with custom-made shin-guards and wrist-straps to track the movement of our arms and legs, I got to work in a number of testing scenarios to gauge how utterly hopeless I was at this ‘beautiful game’. Once I was done shooting and booting, I found the Rezzil software had used a number of different metrics to measure my performance: accuracy (goals versus misses), reaction time (speed of decisions), composure (consistency of accuracy), and technical (use of both feet). Unsurprisingly, I barely scraped 30% for accuracy, and earned a depressing 15% for technical skill. I also managed a 85% score for reaction time, which was surprisingly not far below what some professional athletes scored. However, that last stat may say more about my console gaming reflexes than any quick thinking on the pitch. Either way, I certainly left feeling like more of an athlete than when I arrived. And being able to judge my own performance with four decisive metrics meant I could track even a miniscule improvement if I came back in the future – after some practice, of course. In our talks with Rezzil developers, it became increasingly clear that the scope of the data produced from a simulation is far beyond what you’d get from a single coach watching from the sidelines. Observers could watch my VR training sessions from a variety of angles, with the precise tools to vary the direction, speed, and even spin on a football coming my way. If I was a goalkeeper, I’m told, I’d be able to practise with “perfect service every time”, without the variables of playing on a real pitch in less predictable conditions. I also spoke to Professor Cathy Craig, the CEO of INCISIV Sport – a sports analytics company that creates VR training simulations for the likes of Ulster Rugby and Cricket Ireland. She says she was inspired by the rise of motion-based gaming technologies emerging over the last decade – the Nintendo Wii, PlayStation Move, and the like – and how she realized “movement was becoming a controller” in itself. While VR can’t fully imitate experience on a real-life pitch, there’s also something to be said for low-intensity training in a virtual environment, which allows players to focus on specific skills, or work around minor injuries, without having to put their body through a harrowing workout. Kathy makes a comparison with airline pilots, who have to train extensively in a simulator before they’re trusted in a real cockpit, where one mistake could do frightening damage to the vehicle or the pilot themselves. VR allows those working in high-risk environments – whether pilots, athletes, or otherwise – to hone their technical skill in a “psychologically [and physically] safe environment”. It’s a precaution that hits home for me, as someone who’s had their fair share of running injuries in the midst of intense long-distance training, and had to spend months plodding by on a treadmill before venturing back into the outdoors. It may be a while yet before the average gamer can learn to play like Messi in their living room, but as a support and analysis tool, and one that can teach and train skills in a safe environment, it’s likely VR will only become more crucial for professional teams looking to gain any advantage they can over the competition – without overworking their players in the process.